INTRODUCTION: Following the laparoscopic era, which started towards the end of the last century, natural orifice translumenal endoscopic surgery (NOTES) is the breakthrough of modern surgical technology in the 21st century. Despite rapid advances in the technology and surgical techniques, the attitude on NOTES of the surgeons who perform the surgery is a subject that has yet to be addressed. This study aimed to evaluate the view of surgeons on NOTES. METHODS: This is a questionnaire-based study on the surgeons’ view and attitude on NOTES. 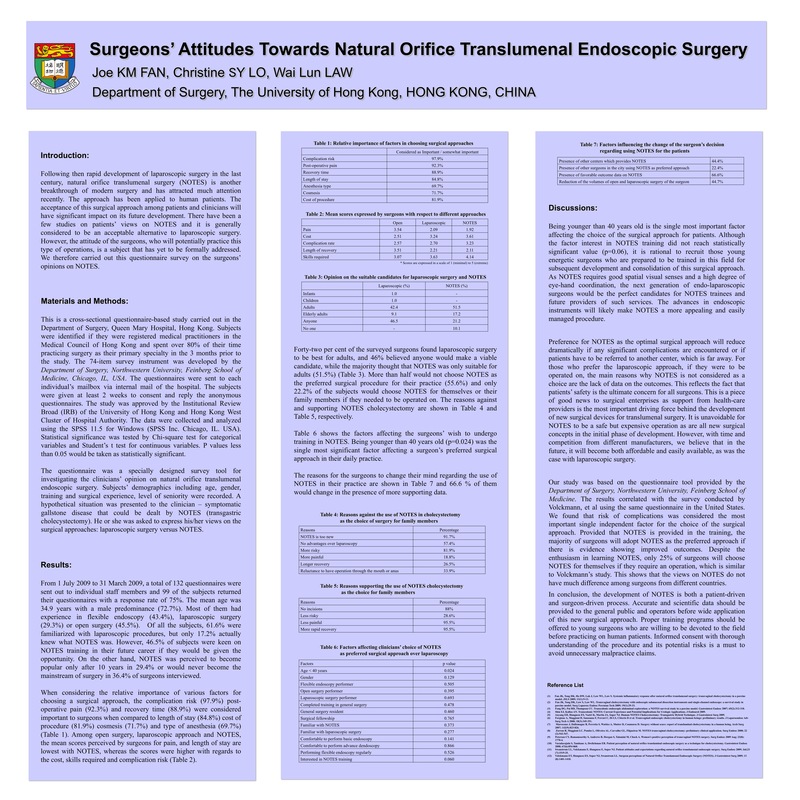 Standard questionnaires were sent to the surgeons in the Department of Surgery, The University of Hong Kong, Queen Mary Hospital to evaluate their view on NOTES. RESULTS: A total of 99 completed questionnaires were returned from the surgeons. The mean age of subjects was 34.9 years, and they were predominantly male (72.9%). NOTES was perceived by 65.7% of subjects as the main-stream of surgery only after 10 years or it would never achieve its position in the future. Risk of complications (97.9%) and post-operative pain (92.3%) were the most important factors to be considered when a surgical approach would be chosen. Most surgeons thought that higher level of skills and cost would be required for NOTES when compared with laparoscopic or open surgery. Only 24.2% of surgeons would choose NOTES for themselves as 91.7% considered it to be too new or 81.9% viewed it as more risky. Being younger than 40 years old was the significant factor affecting the choice of preferred surgical approach for patients (p=0.024). The majority (66.6%) would change their mind in the availability of data showing improved outcome. CONCLUSIONS: NOTES is still not acceptable among surgeons in Hong Kong. Education and information to the surgeons is important to promote the research and future practice of NOTES.